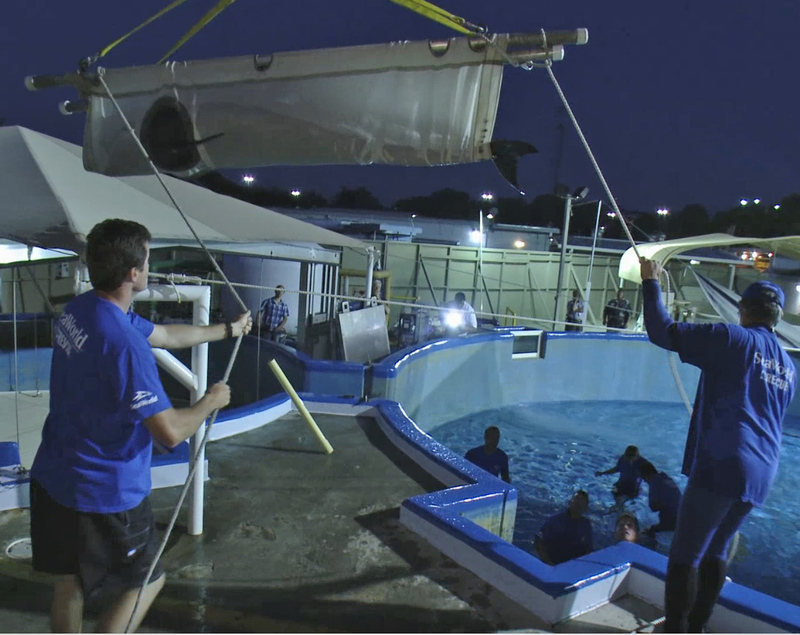 from the Institute for Marine Mammal Studies (IMMS) in Gulfport, MS since her arrival August 4, 2010. 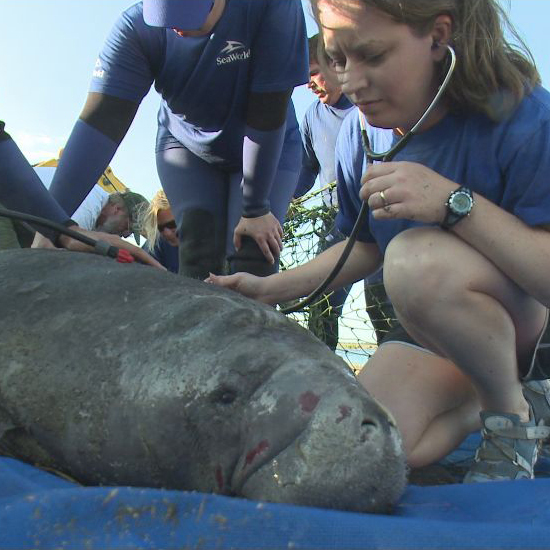 Big Mama had bite wounds and was missing parts of her front and hind flippers. 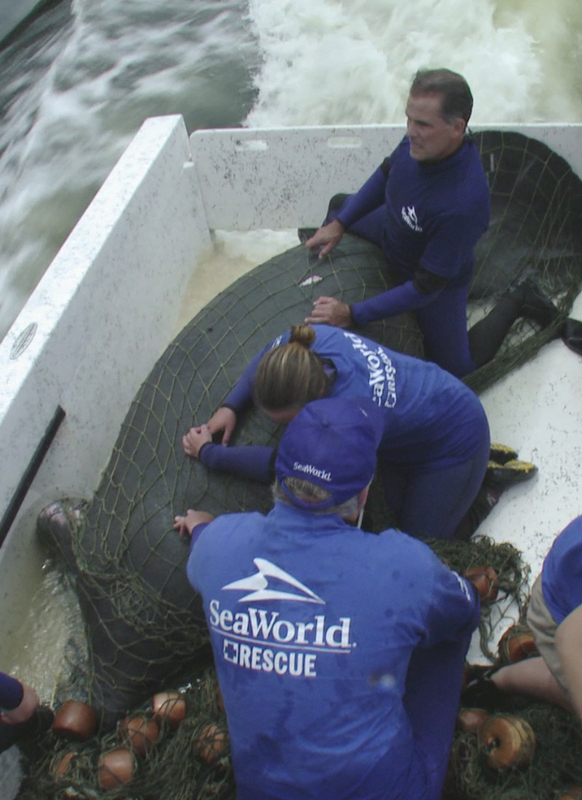 Because of these injuries, she was unable to swim properly, making it impossible for her to survive in the wild. The U.S. 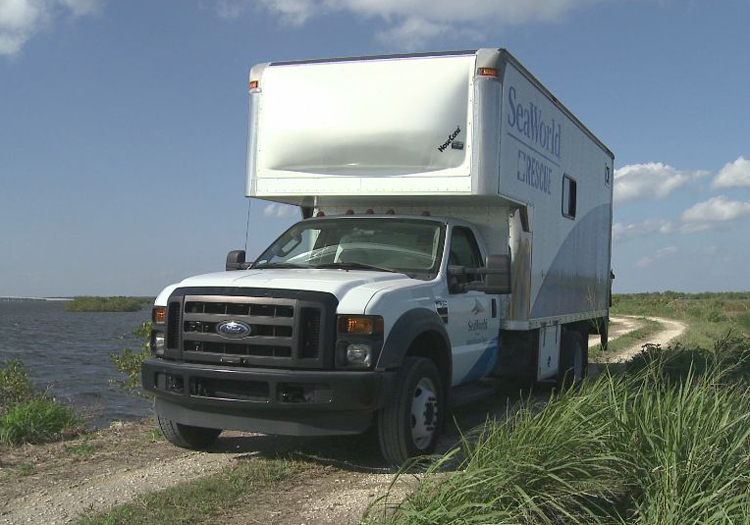 Fish and Wildlife Service deemed her non-releasable in 2012. 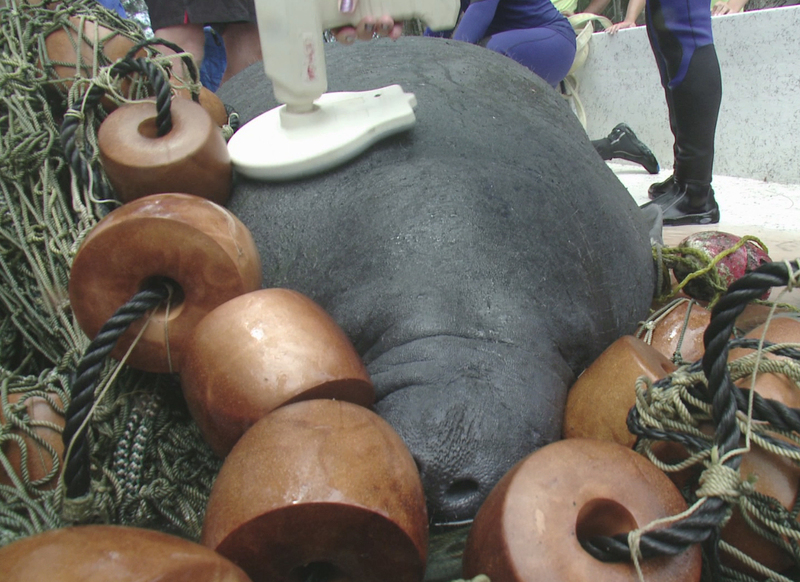 The IMMS worked with other agencies to find a more permanent home where she could have a larger habitat and interact with other animals, and so she could educate others with her story. 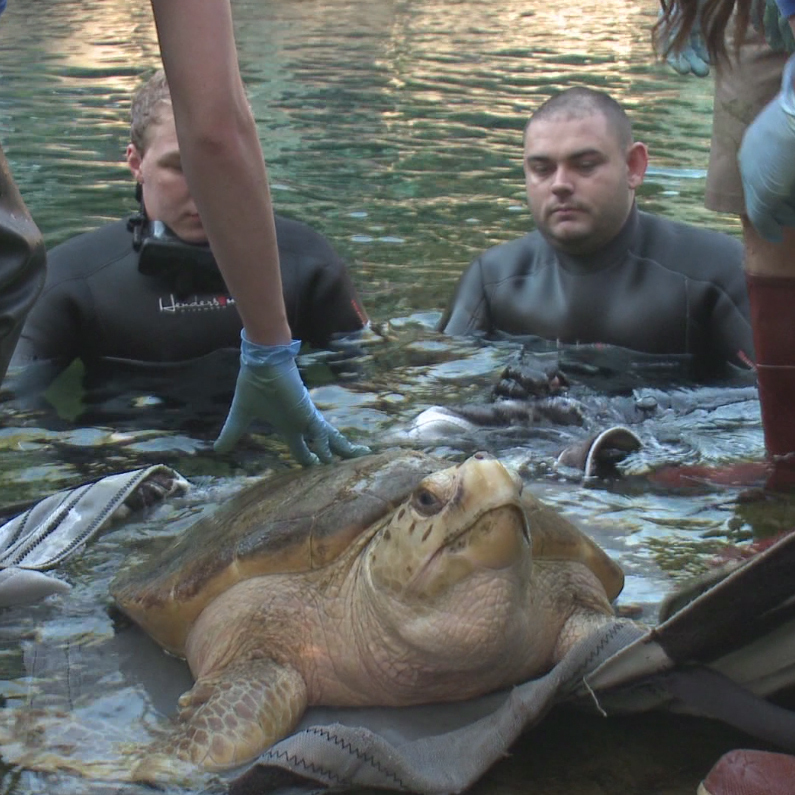 Caton, a 95-pound subadult, was initially found stranded in 2009 on Ossabaw Island and was treated by the Georgia Sea Turtle Center (GSTC). 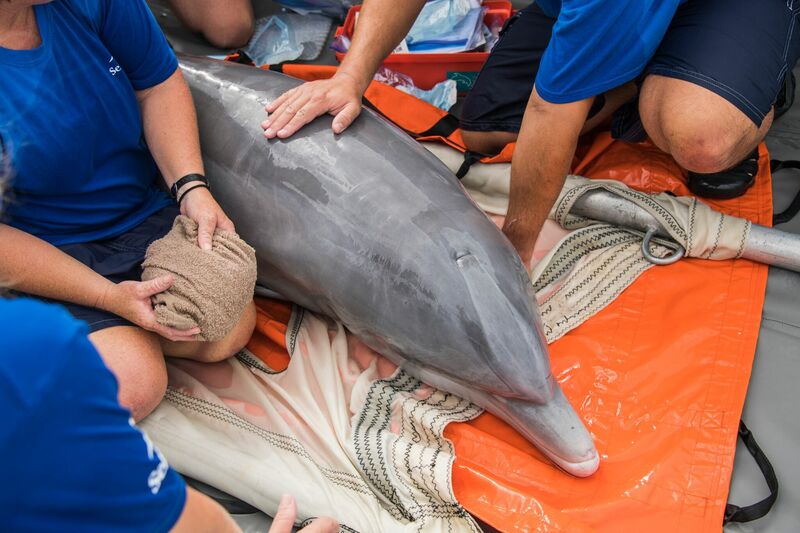 In December she was considered healthy enough to be returned to the wild, but Caton had other plans. 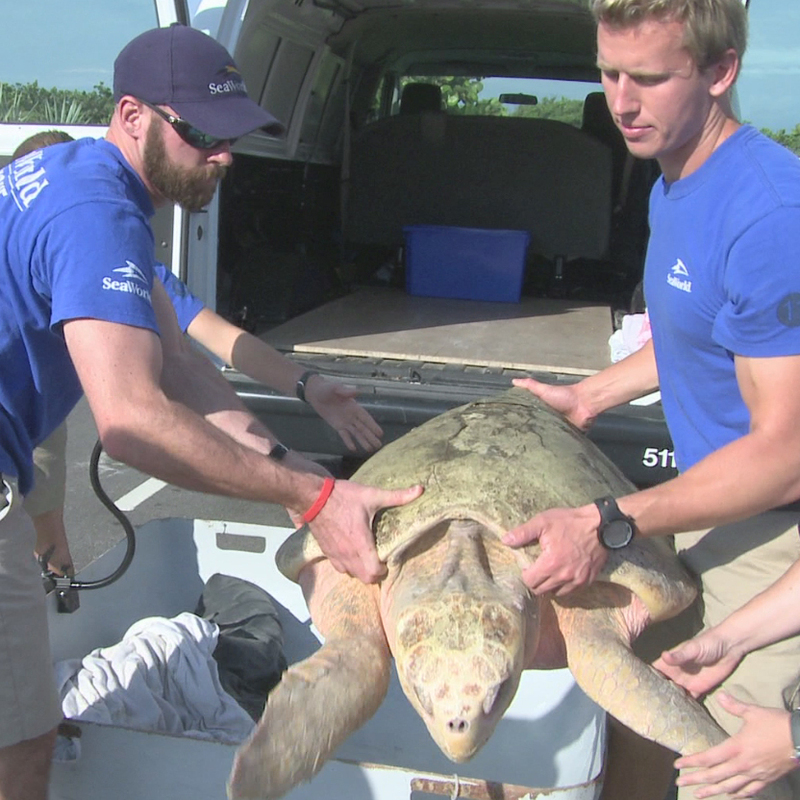 The subadult female loggerhead was taken to the warm waters of Cape Canaveral National Seashore. 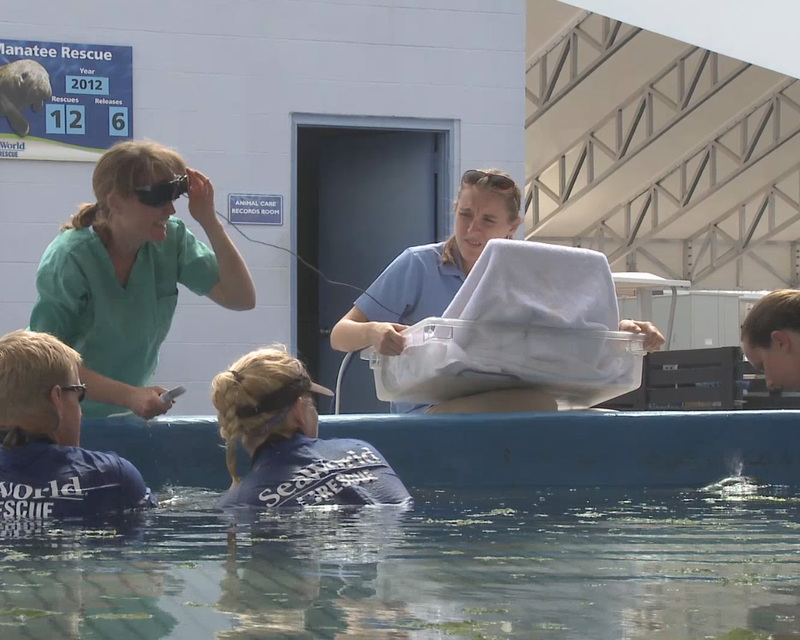 Rather than swimming off, Caton just sat there, prompting a return to the GSTC for a few more months rehabilitation. 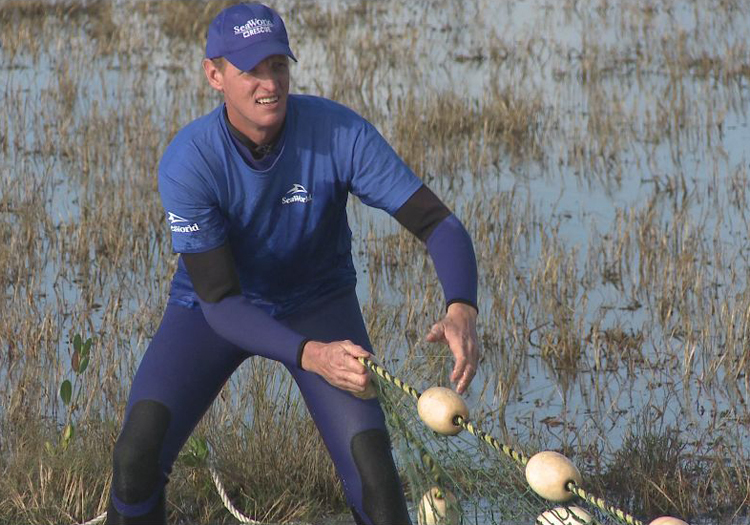 In a second attempt, Caton became stuck on a sandbar after unsuccessfully swimming back and forth in the shallows. 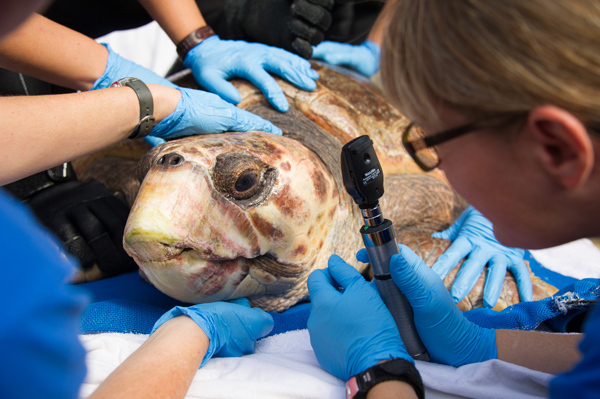 In October 2012 she was released again to deep water, but one week later, reports of a loggerhead stranding led to Caton, again stranded on the beach. 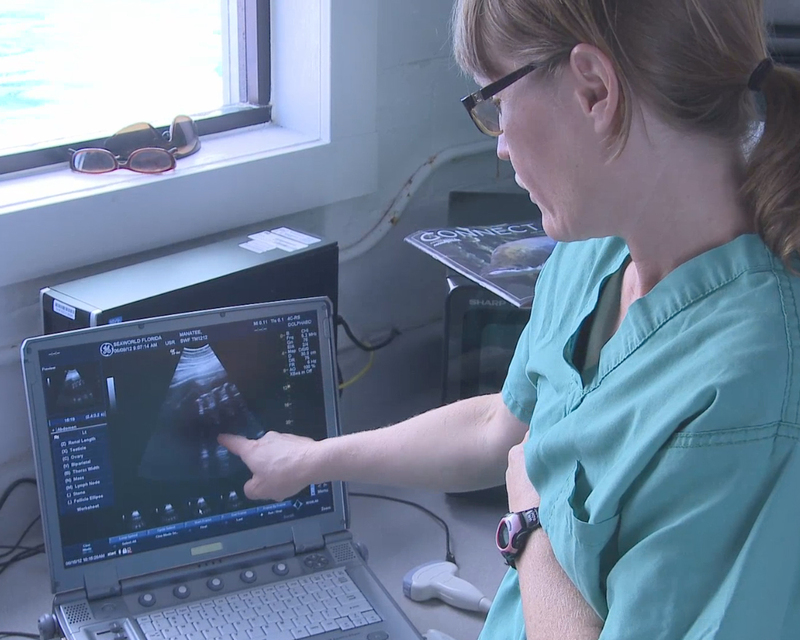 Wildlife government officials involved, agree that Caton was unreleasable. 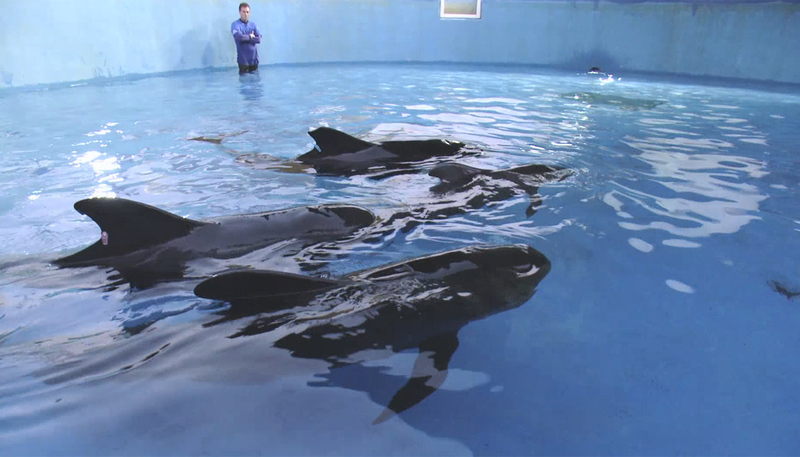 Terry Norton, veterinarian and director of the center, agreed. 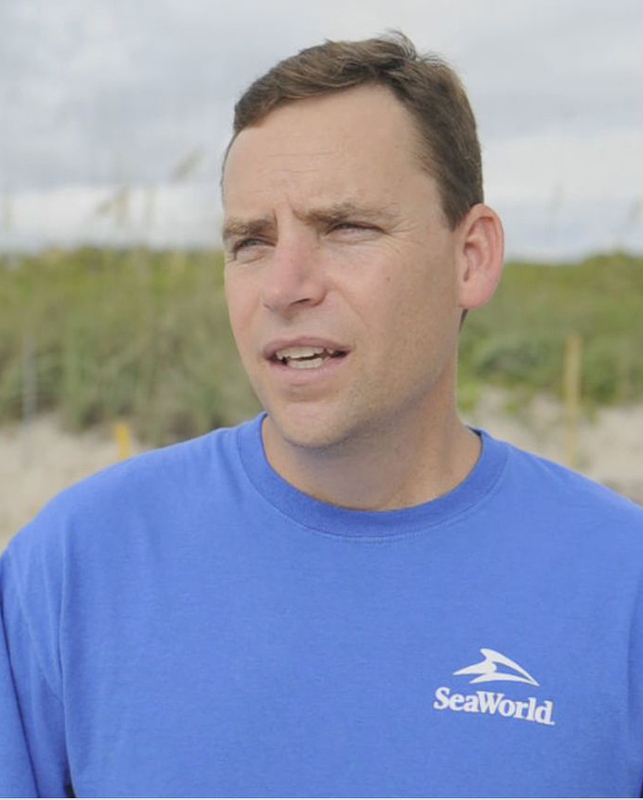 “If an unreleasable sea turtle can survive comfortably in a captive setting, the center will make every attempt to place the turtle in a suitable facility,’’ he said. 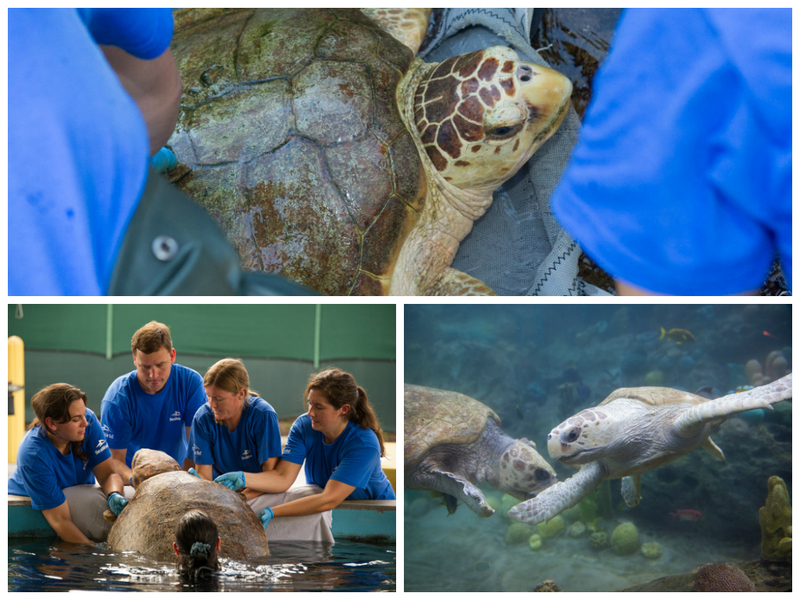 Big Mama and Caton will now have a new home at TurtleTrek, SeaWorld along with 14 other rescued sea turtles, including a hawksbill, 10 green and three other loggerheads who have all been deemed unreleasable. 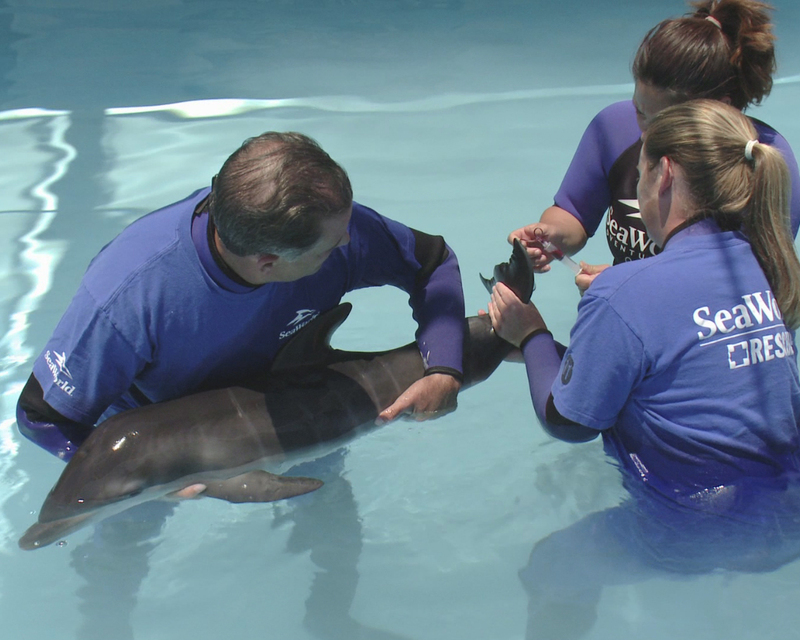 These animals will welcome guests at SeaWorld Orlando and will educate them about wildlife conservation. 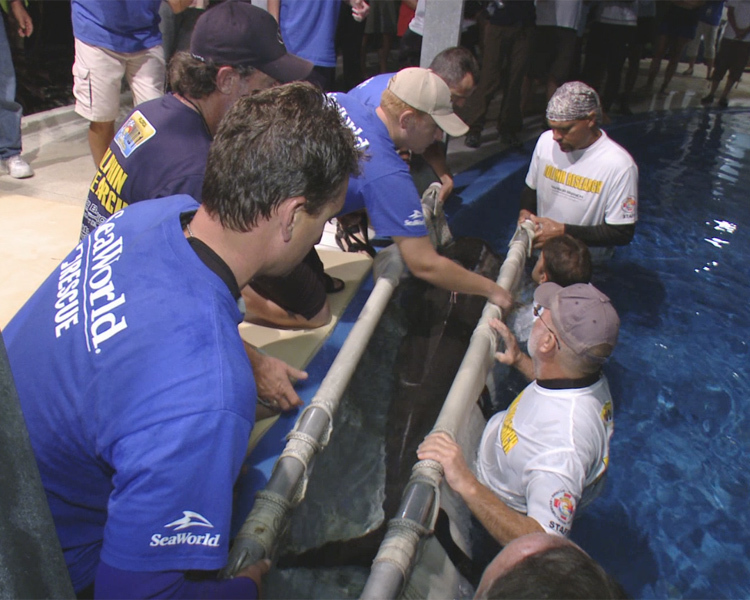 Together they will share the message that conservation is everyone’s responsibility. They’ll encourage each person to make a difference, and become “Everyday Heroes” through their day-to-day actions. 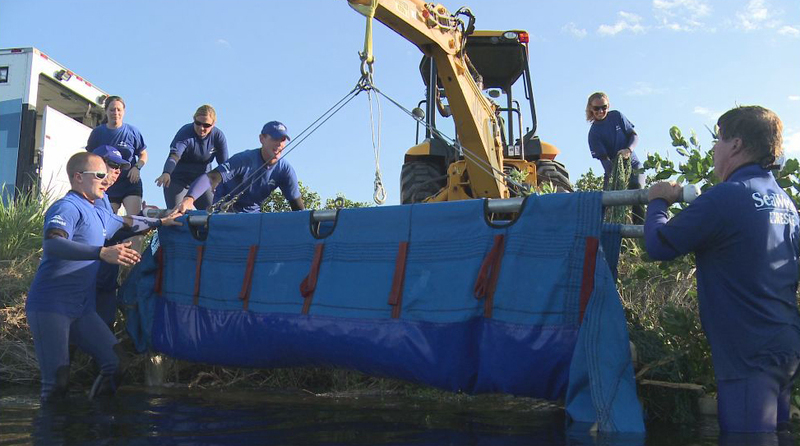 In collaboration with the government and other members of accredited stranding networks, SeaWorld Parks & Entertainment operates one of the world’s most respected programs to rescue ill and injured marine animals, with the goal to rehabilitate and return to the waters. 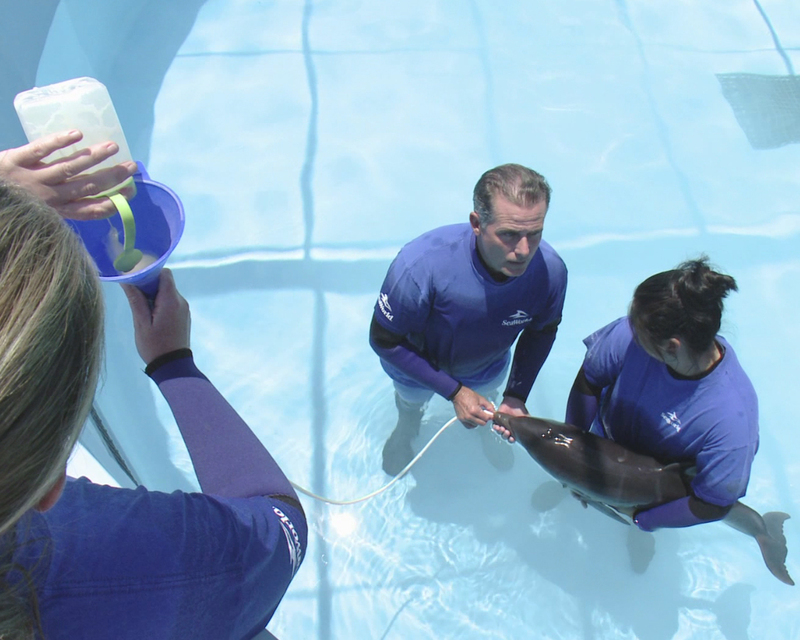 SeaWorld animal experts have helped more than 22,000 animals in need – ill, injured, orphaned and abandoned – for more than four decades. 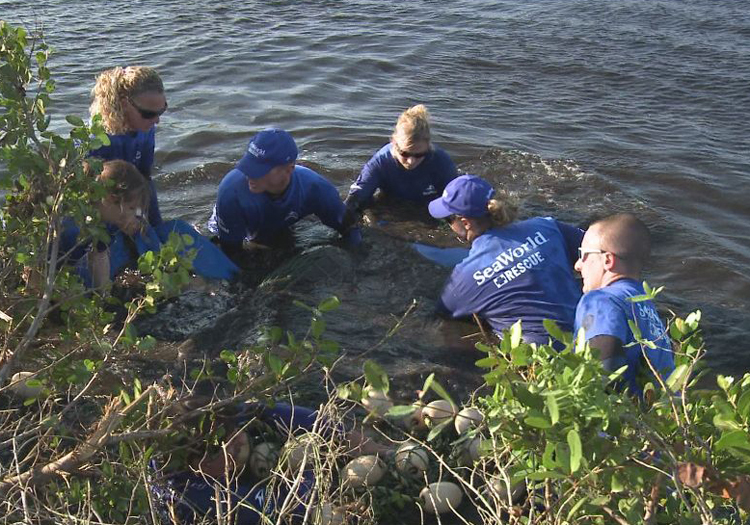 So far this year, SeaWorld Orlando has rescued 52 and returned 45 sea turtles. 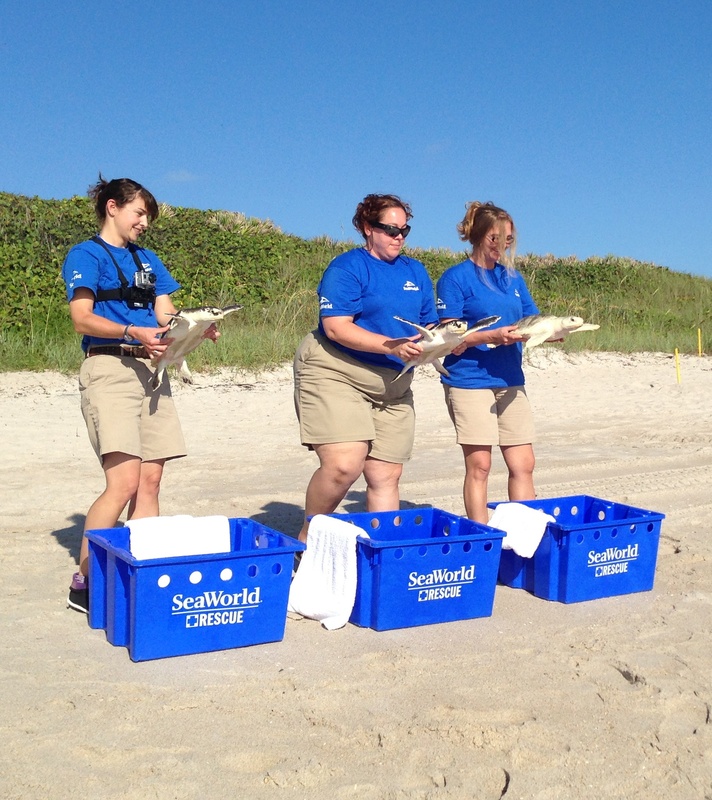 After a several months of rehabilitation after cold stress, three Kemp’s Ridley sea turtles were medically cleared and returned to Playalinda Beach at Canaveral Seashore this morning (June 27, 2013). 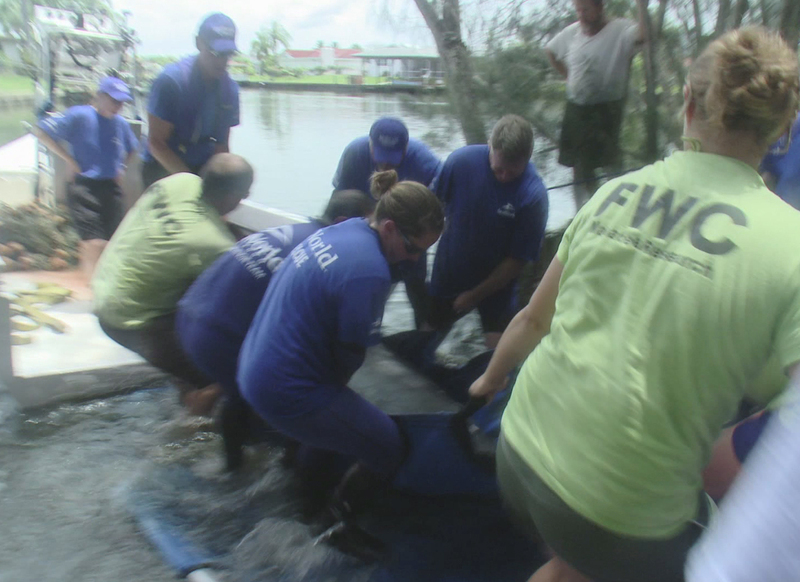 Two of the turtles had pneumonia and the third had a small wound to its carapace (shell). 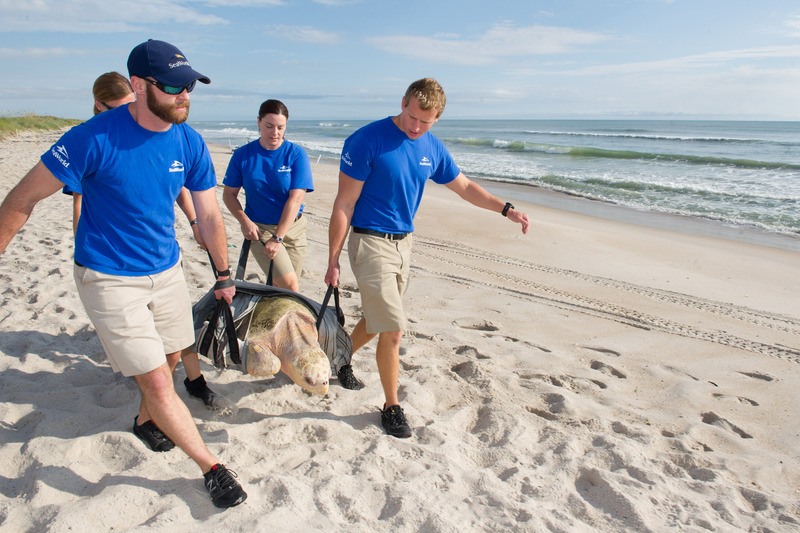 According to SeaWorld, “The Kemp’s Ridley sea turtles measured approximately 70 centimeters in length and weighed 7 – 10 pounds, all gaining approximately 3-6 pounds” while at SeaWorld. 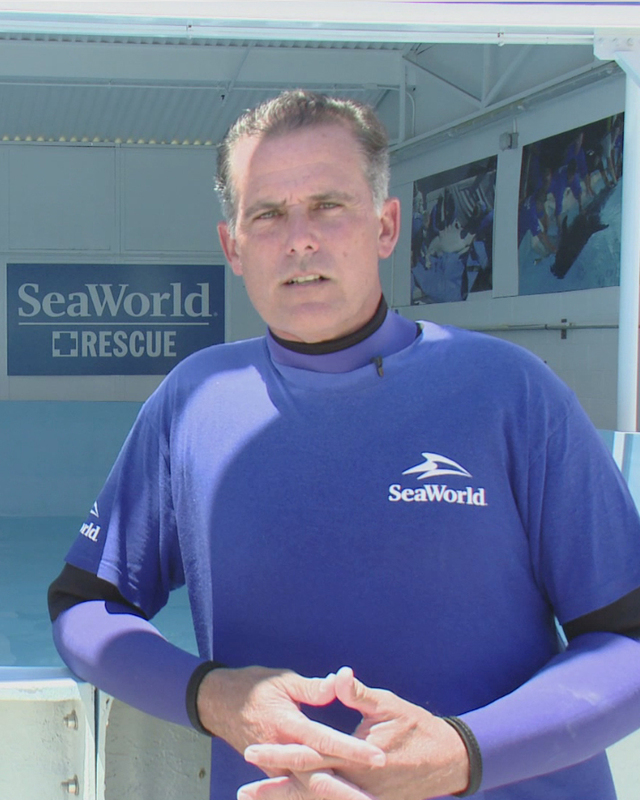 The turtles were part of a group of 36 brought to SeaWorld Orlando by the U.S. Coast Guard on December 23, 2012 from Cape Cod, Massachusetts. 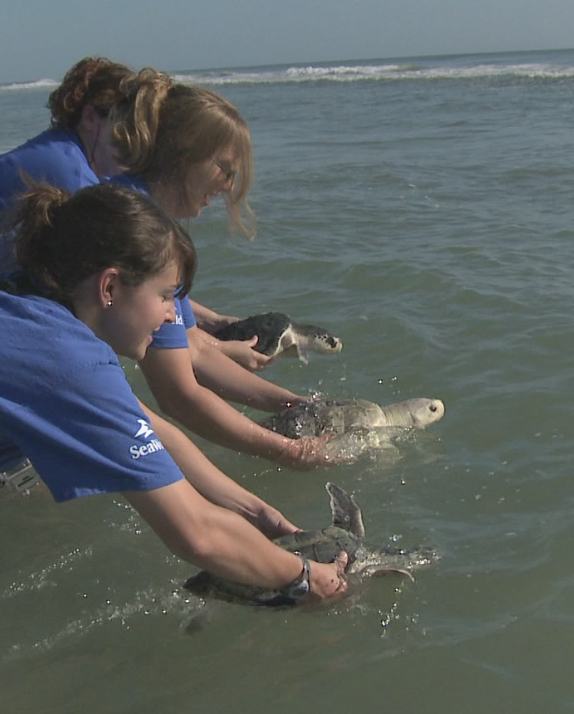 Of the 36, this release marks a total of 34 of them being returned to the sea. 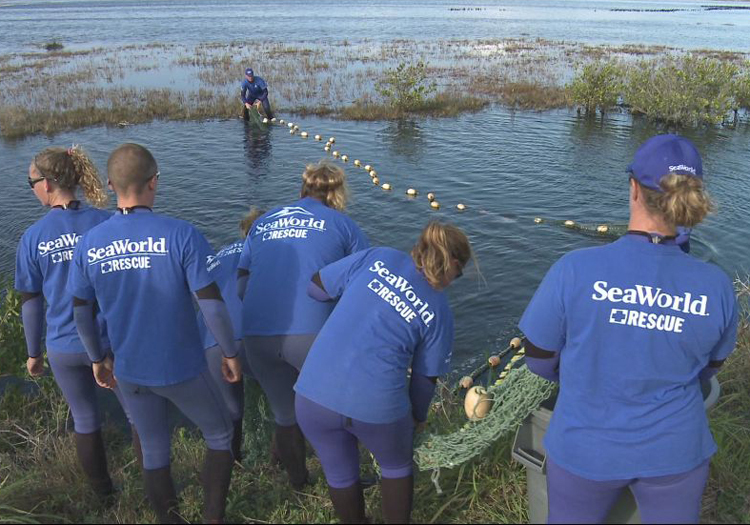 So far this year, SeaWorld Orlando has rescued 45 sea turtles and returned 35. 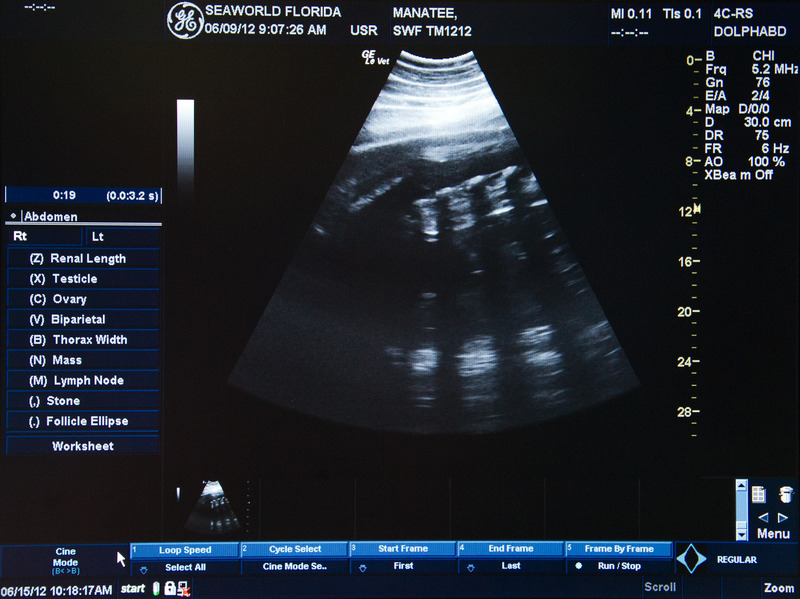 A sonogram taken July 20 clearly shows the calf’s spine and a heartbeat. 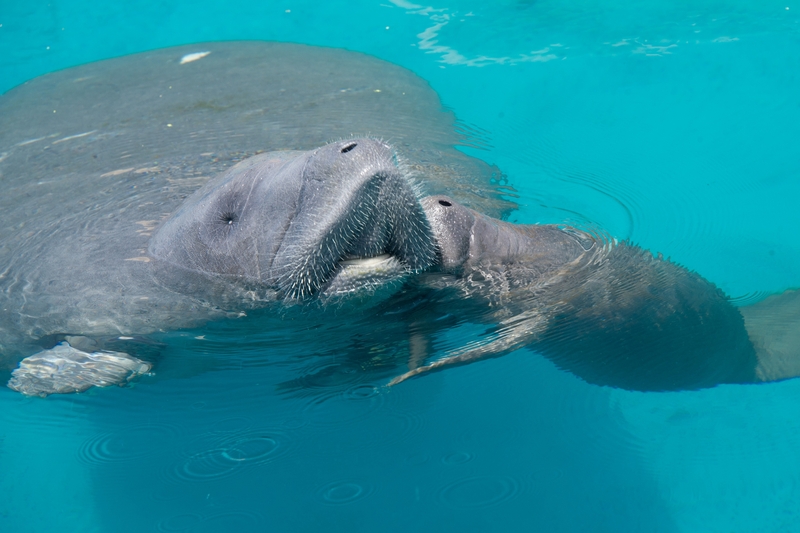 The pregnant manatee rescued in Merritt Island, FL on June 8 (read about it here) gave birth to a healthy calf July 18, 2012, sometime between 3 and 6 a.m. 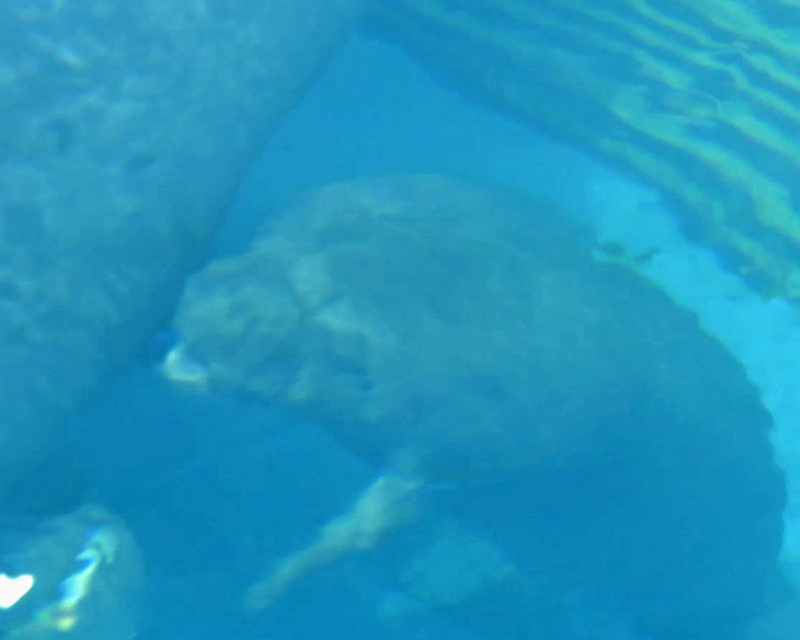 Both mother and baby are said to be doing well. 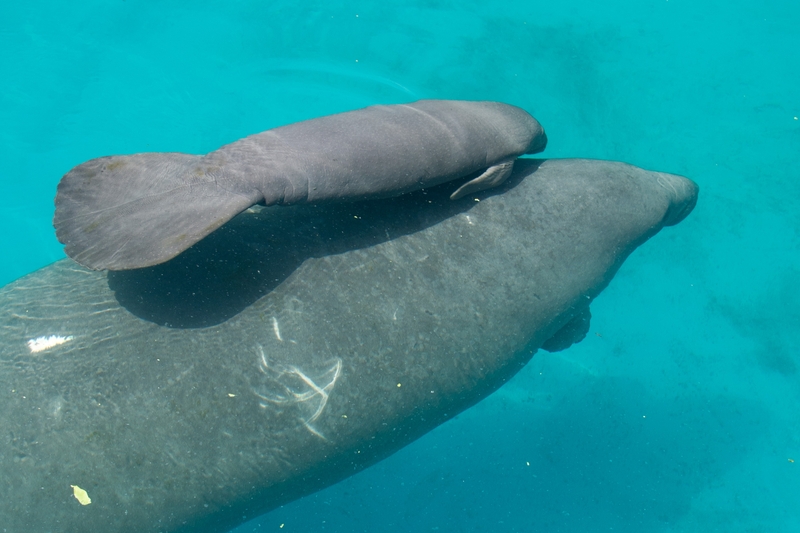 The newborn is healthy, nursing and swimming close to its mother. 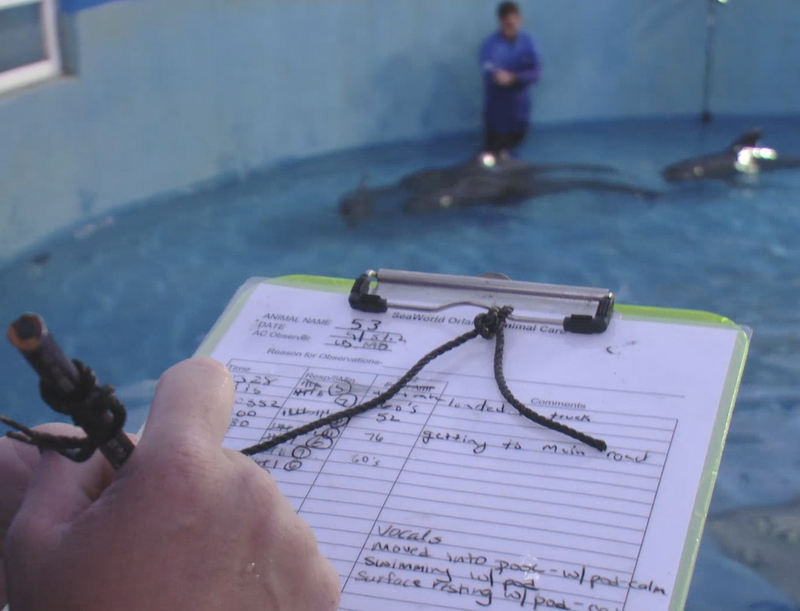 SeaWorld’s Animal Care team has the pair under 24-hour surveillance. The new baby gives its mom a little kiss! 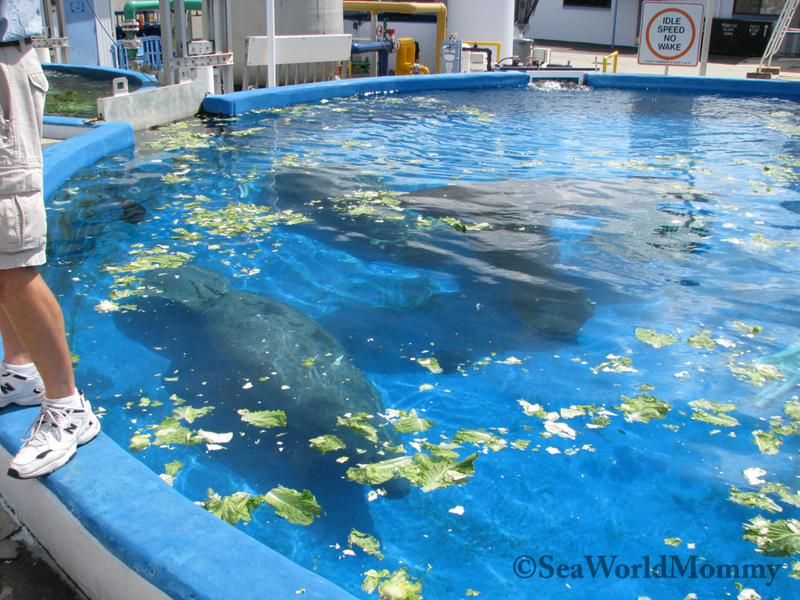 New calf bonding with mom in a back area pool at SeaWorld, Orlando. 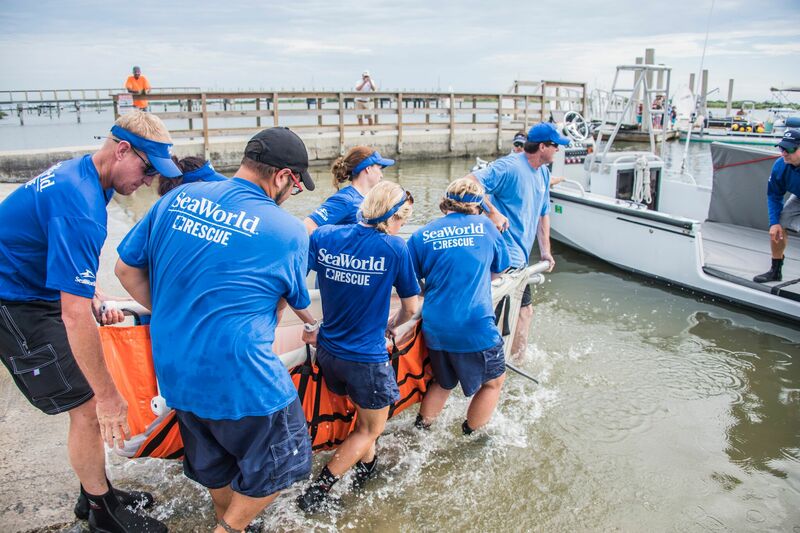 The SeaWorld Animal Rescue Team went to Canaveral National Seashore today (July 17, 2012) to release two sea turtles that were rescued in February of this year. 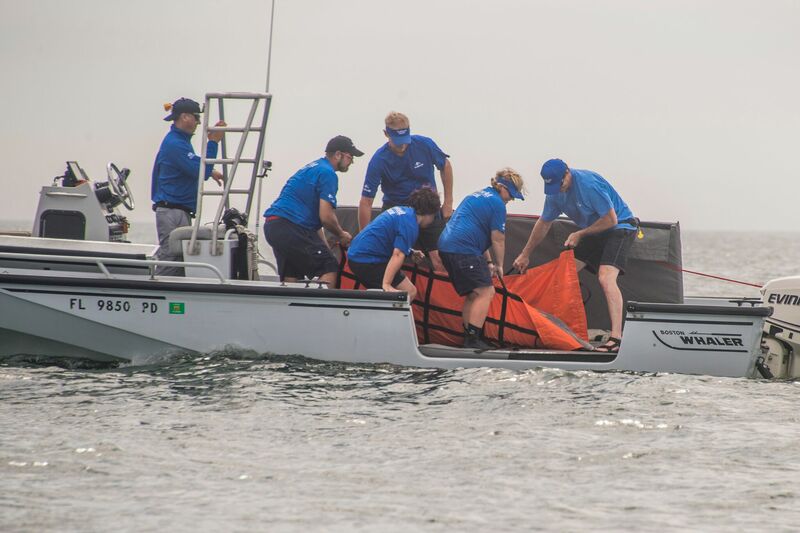 The larger of the two, a 140-pound loggerhead turtle rescued from Melbourne Beach, was brought to SeaWorld after what was most likely a boat-strike injury. 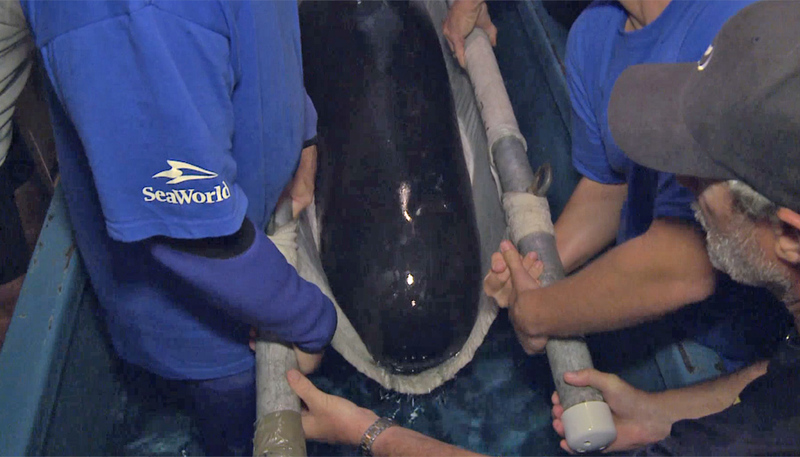 It received a thorough checkup, x-rays, andtibiotics and extensive treatment. Despite their best efforts, part of the turtle’s carapace, or shell, was lost. 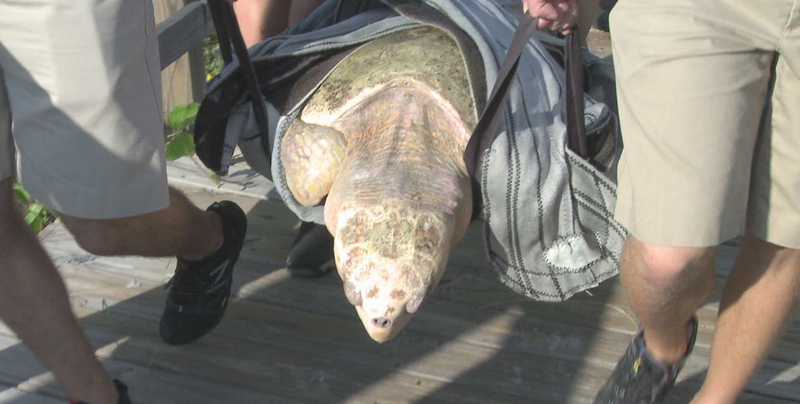 The smaller green sea turtle was found beached at Canaveral National Seashore after having been caught in fishing line. 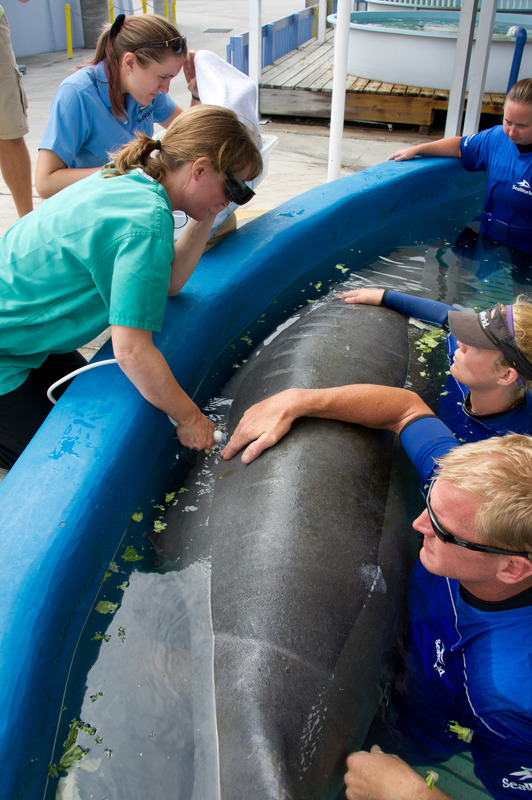 Veterinarians cared for the injuries on its front flippers and neck with weekly treatments until it was healthy enough to be returned.